I think it was the crystal handles that I like most about this faucet. 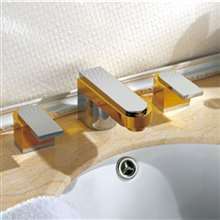 It adds a touch of elegance and luxury to the whole faucet, that in addition of course to the nice gold finish. Overall, the design looks nice, but I did see some other gold finished faucets here in the site which I think I'd like better. 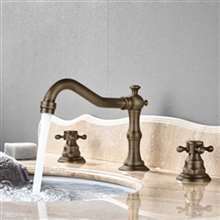 Nonetheless, this looks great and works as well as any other faucet. The main reason why I chose this one is because of the gold color. I thought it would look very nice especially since it was coupled with those crystal handles, but then the gold color was a bit paleâ€”at least that's how I see it. It actually negatively impacts the overall appeal of the thing. Nonetheless, this faucet works great and is worth considering. I was kind of frustrated because the delivery came late. I was supposed to have it installed over the weekend but it didn't come. It came on Monday, which meant I had to wait for another weekend before I was able to finally have it installed. Despite that, the product seemed decent and worth the price, but I wish the delivery didn't take that long. We had this one installed in the master en suite and we couldn't be happier. This faucet is just great, with the nice gold finish and the crystal handles. It really looks luxurious and elegant, which helped to improve the appeal of our bathroom. The quality seems to be quite good, though we've had this for only about a week so that will need to be seen later on. I'll be giving an update on its performance and durability probably soon. The management has approved the renovations and we were looking for bathroom fixtures that would enhance our bathroom's appeal - and here it is! When I showed this to my supervisor, he was ecstatic! We placed the order and after having it installed, we knew right away that it was one of the best business decisions that we've made so far. Thanks Fontana Showers for such a wonderful product!